This is number 3 in my series of unusual fold cards and it is a revist to one I made some time ago but didn't ever make a tutorial for. This one opens up to make a lumiere if you pop a battery candle/tea light or even a small chain of fairy lights inside. 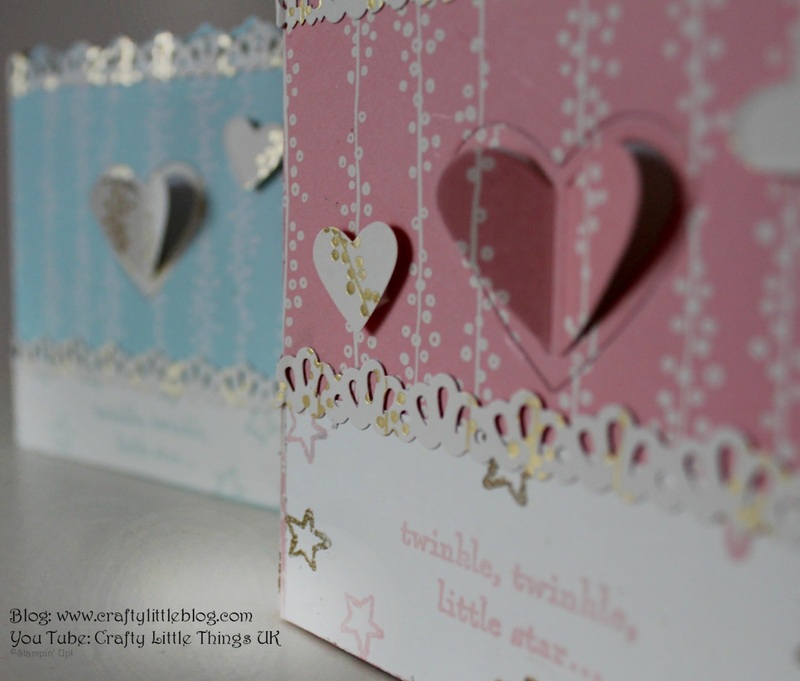 The little vellum windows allow soft light to shine through and the gorgeous foiling on the inside creates a beautiful reflective glow coming through the top, taking on the shape of the ribbon punch trim around the edges to give a fabulous muted night light. 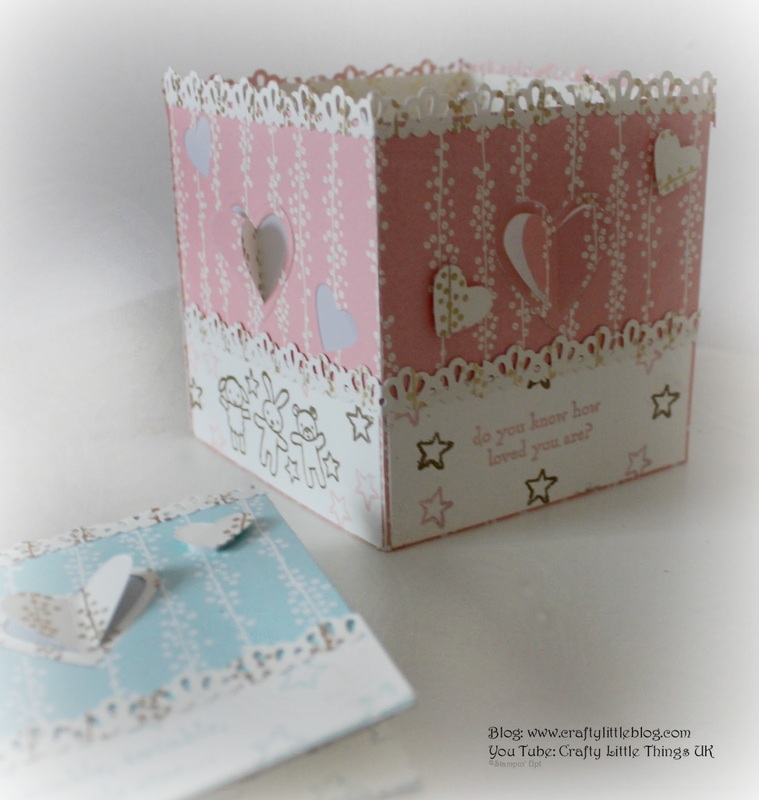 In the video tutorial, available here, I make the pink one having already made the blue one some time ago. It was a prototype so I remade it to give to the lucky people taking delivery of their baby and this has remained on my office shelf ever since. I don't use any cardstock base for this card, because of the structure and quality of the DSP there isn't any need. 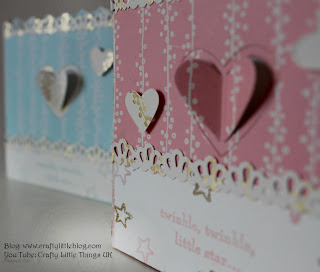 I used Moon Baby stamp set and also did a bit of gold heat embossing and of course die cutting of the hearts backed with vellum punched circles to keep thee inside looking uncluttered and neat. It can all be made using one 12 x 12 sheet of Bundle of Love speciality paper and you still have a few generous chunks left to make an impact on a couple or more cards in the future. So it's great value in terms of damage to your stash. Have fun making it or something like it.